Mitchells Cottage is fortunate enough to be close to some of the best diving waters in Europe. 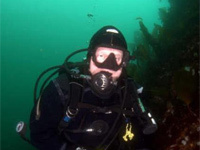 Scuba Dive West, situated beside Glasilaun beech is one of Irelands premier dive centres. The centre is a PADI 5 Star Dive Centre and National Geographic Resort. Shore dives, boat dives, island safari’s, wreck dives to mention a few are all available. ‘THE BRAZEN HUSSY’ A great way to pass the day and it’s right on your doorstep. For boat trips and charters specialising in diving, deep sea angling, island adventures, filming and surveying, contact: Shane R. Bisgood, Ballynew, Moyard, Co. Galway. 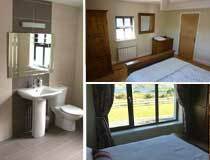 Renvyle House Hotel - Fly-Fishing is available to non-residents of the hotel. A full day’s fishing costs €50 and half day €25 (both include the use of a boat). Make advance booking beforehand. At Lough Inagh - Lough Inagh Lodge Hotel - For lake fishing in the Inagh Valley contact the hotel. 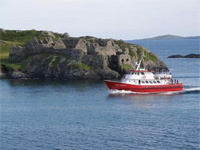 Ireland's only glass-bottom boat tours - purpose built to the highest safety standards and certified by the Department of Transport to operate one of Europe's most scenic and well-protected harbours. Ballinakill Harbour is home to a large variety of sea birds, grey seals, dolphins and porpoises are frequent visitors. See the underwater world as only seen before by divers, commentary throughout the tour. 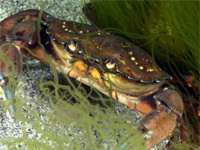 For best under-water viewing, lower tides are best - please enquire beforehand. Private boat trips can be arranged at reasonable rates. These sea trips are tailored to suit your requirements. Whether its bird watching, whale watching or island hoping you’re into. Letterfrack, Co. Galway. The Killary Fjord is unique to Ireland and is 9 miles in length and boasts wonderful scenery. A purpose built vessel offers cruises up and down the fjord. Enjoy a meal onboard as you admire the scenery. No Sea-Sickness Guarantee. Fresh water fishing, from fast flowing rivers to mountain lakes, to shore angling and deep sea fishing. Less than 3km from your accommodation. 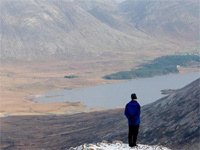 The Killary Adventure Group is based on Ireland’s only Fjord – The Killary Fjord – in Leenane, Co. Galway and surrounded by some of the most idyllic scenery that Connemara has to offer. If it is High Octane bungy jumps, a gentle cycling or walking tour through the Irish countryside, an exciting & energetic trip, Skiing, or a Surfing holiday, away from the hustle and bustle, filled with thrilling new adventures, with over 25 years of experience in ADVENTURE HOLIDAYS, the Killary group caters for you all. Delphi is a great place to experience the great outdoors. Whether its climbing to the top of Mweelrea, the highest mountain in the West of Ireland, catching your first surf break on the breathtaking Cross beach, or sea kayaking through the majestic Killary Fjord. They have a suite of over 25 ocean, forest, and Mountain based activities. TULLY MOUNTAIN is directly across the bay from Mitchells Cottage (see main photo). Tully mountain is well suited to beginner climbers but the views from up high will amaze even the experienced climber. Best climbed from the Letterfrack/Derryinver side of the mountain. DIAMOND HILL in the Connemara national park. There are many walks to suits all levels of ability. Views of thousands of acres of sea and land. Enter through the National Park in Letterfrack. Entry is free. TWELVE BENS Most of the Twelve Bens Mountain range can be seen from the area. If you’re in to climbing then you’ll be in climbing heaven. Various routes and starting points. Michael Gibbons Walking Ireland, is run by one of Ireland's leading Field Archaeologists. Michael specialises in Archaeological and Historical Tours of Ireland West for academic and student groups, as well as individuals seeking a deeper understanding of Ireland's rich cultural heritage. Tailor-made tours allow an in-depth exploration of Irish Highlands and Islands of the Atlantic West Coast, with a particular focus on Sacred Mountains and Pilgrimage Landscapes. Trips can be made on foot, by coach and by boat. Traditional music, song and dance every Tuesday evening at 9 p.m. in Tully, Renvyle, five miles from your accommodation. Entry fee is €10. Open summer season only. Arrive early to avoid dissapointment. Bicycles are available to hire from the Bards Den in Letterfrack village. 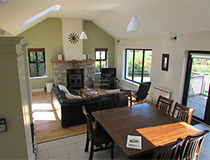 If you would like to avail of private Satyananda Yoga classes at Mitchells cottage you can do so by booking in advance. Satyananda yoga is a complete holistic system, a type of yoga that is suitable for all, utilising practices in a traditional way. The cost is €70 per class of up to 4 people. The duration of a class is one and a half hours. 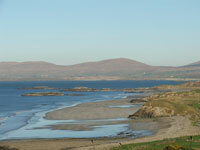 Cleggan Beach Riding Centre is located in Cleggan Village overlooking Cleggan Beach. The Cleggan Beach Riding Centre is an approved riding school and is one of Connemara's most renowned beach trekking centre. 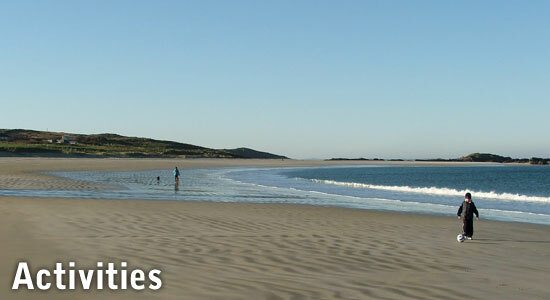 Facilities include: A variety of beach trekking available. Mountain treks. Three resident qualified instructors. Safe, well-schooled horses and ponies suitable for all ages and standards. Enclosed outdoor arena and short and long treks. Cleggan Beach Riding Centre, Cleggan, Connemara, Co. Galway, Ireland. Errislannan Manor is four miles south of Clifden. Sheltered by a surrounding wood the Manor overlooks the trout lake and is bounded by Connemara's moors and mountains. It houses the Errislannan Manor Connemara pony stud and riding centre and is the home of the Connemara Branch of the Irish Pony Club. Riding and trekking on Connemara ponies takes place by the hour each morning from Monday to Friday inclusive. German & French spoken. Longer treks can be arranged. Riding lessons for adults and children. Ponycraft courses for children by the day 8.30 -4.00pm. Residential ponycraft course for unaccompanied children. No Sunday riding. 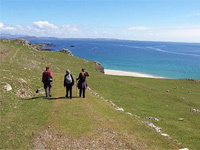 Private treks can be arranged. 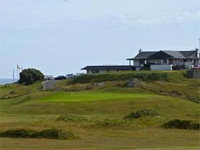 Nestled between the scenic splendour of the 12 Bens mountain range and the rugged Atlantic ocean, lies Connemara Golf Links. From the testing dog leg opening hole through to the breathtaking back 9, which have been acknowledged as the "equal to any in the world". Nine hole golf course, six miles from Letterfrack. From lessons to trekking on the beach, both short and long treks are available in the area.